When the city of Los Angeles refused to address an epidemic of homelessness — seen in sprawling and dangerous tent cities — a struggling musician answered the call and built dozens of solar-powered tiny houses to give those down on their luck a place to call home. 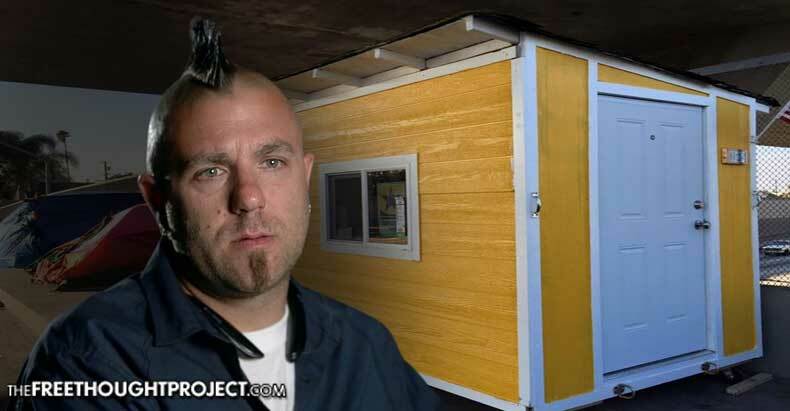 Elvis Summers crowdfunded tiny homes in part through his nonprofit, Starting Human, and raised over $100,000 for what he viewed as a decent, if temporary, solution. And with the help of volunteers in the contracting and construction business, built some 40 tiny homes of wood with steel-reinforced, locking doors to provide solid shelter for struggling tent-city residents. Summers, who experienced houselessness in his 20s, viewed the little, self-sufficient houses as a creative solution to L.A.’s colossal homeless issue — particularly as the wooden structures provided a solid home base for those seeking jobs or drug and alcohol treatment. Summers’ project went swimmingly — individuals who’d survived in flimsy tents with little to no security felt the dignity of a structure to call home base. That is, until the city of Los Angeles put its foot down, kicked several tiny home residents, out, and transported the structures for demolition. Suddenly evicted tiny house residents weren’t permitted to retrieve their few belongings — including medications — before police and garbage trucks hauled the homes away. Summers managed to pack up a few of the tiny homes on public property, but was forced to evict residents, himself — simply in hopes of saving the structures from the city. City Council had met to address L.A.’s notorious homeless issue, and councilmembers and local residents expressed outrage over the tiny homes they deemed eyesores and mere bandaids for the greater problem. “When the city took those three houses, they chose to do it at the exact same time that the council and the mayor were at City Hall unveiling the mayor’s new homeless $1.27 billion plan,” Summers explained. That plan seeks to create permanent transitioning housing for the homeless, among other programs, but does not immediately address the city’s crisis. — are indeed temporary, but offer a roof, walls, and relative security in the interim. Living in tents provides neither security or dignity and can make procuring a job or beating an addiction a seeming impossibility. These tiny houses constituted a jumping off point — a sturdy base — for residents to rely on. Summers acknowledged to Reason the structures don’t answer what underpins the city’s immense homelessness problem, but explained the houses have their place in working toward solutions. Scrambling to guard one’s few possessions, and the uncertainty important belongings — such as a cell phone or copies of a resume or clothing — might not be where you left them is an insidious stressor for many people without homes. Summers noted he never intended the tiny houses to be a permanent solution, rather, they could provide an intermediate step as the city solidifies other programs and housing options. But Los Angeles Mayor Eric Garcetti doesn’t see the tiny homes as sufficient. Additional controversy and conflict with local, permanent residents arose from the location of a smattering of these tiny homes. While many nestled onto private property — like a parking lot — donated to the cause, others sprung up on highway overpasses and in neighborhoods, much to the chagrin of locals who viewed the shelters as safety hazards and nuisances. After amending an ordinance for clearing homeless ‘villages,’ police and city sanitation workers descended on several areas where tiny homes were located, and confiscated the properties without providing notice or allowing dwellers to gather their possessions. Locals cheered the move while a number of people found themselves worse off than before Summers’ homes provided shelter. “You go out and spend, you know, many nights on the street and be treated as a monster, and then be given a warm place to stay and tell me you’re not going to call it a home,” Summers told Reason in an interview. Under intense national criticism, Los Angeles returned the seized tiny homes to residents in May — sans the solar-power systems which provided much-needed lighting — with the advisement Summers only locate the structures on private property. Stalling over the red tape of further ‘studying the issue,’ the city of Los Angeles refuses to back Elvis Summers’ tiny home project, as well as additional creative solutions offered by others. Meanwhile, tent cities continue popping up and the city’s many vacant lots, which could easily be bases for temporary tiny home communities, simply grow weeds.